I just bought one, and was somewhat surprised to learn that once you spend more than $700, your money is pretty much wasted because the extra money goes into substituting high-end road bike parts for the mid-range mix of road and mountain bike parts that are on less pricey models. So you end up with what is essentially a road bike with a straight handlebar. Twenty years ago, once you spent more than $700, your money was pretty much wasted because the extra money went into substituting high-end mountain bike parts for the mix of parts that was on the less pricey models. So what you ended up with was a basically mountain bike with smooth tires. The surprise is that the price point at which it’s pointless to spend more hasn’t budged in unadjusted dollars. Maybe it shouldn’t be a surprise, since the hybrid I bought twenty years ago was made in the USA. That made it something of a holdout even then (most manufacturers had offshored their manufacturing to Asia, generally Taiwan, even then). Now virtually every bike is Made in China. Well, some of the ones which are fundamentally road bikes with straight handlebars are made in Taiwan, but I don’t want a road bike. “Road” bikes are designed for an ideal world where street departments resurface every paved surface every five years. Particularly in Seattle, a city that has raised neglect of street maintenance to a high art, that’s an unrealistic premise. I’d rather have tires with a bit of width and tread to them to cushion the shocks and enable me to better stay in control. Go away! You’re not a member of the club! Is that what the author of this article on pugetsoundanarchists.org is saying to anyone who does not currently self-identify as an anarchist when s/he says “groups other than our intended readership?” I certainly hope not, because if they are, it’s tantamount to a wish for perpetual irrelevance, because if anarchism is to ever to be a meaningful movement capable of having an effect on the world we anarchists must grow well beyond our current miniscule numbers. I blew about two hours trying to list an item (yes, just one) on eBay tonight. First I had to go and change all my addresses, and for some reason eBay has four of them, all independent of each other. Then I have to change my two PayPal addresses as well. Both processes mean waiting for and responding to a confirmation e-mail. Then there’s the composing of the ad wording, taking of the pictures, editing of the pictures, and downloading of the pictures. Wait, does my ad say the item is in Portland? Why, yes, it does, even though I just told eBay four times in a row that I now live in Seattle. Log back in, and eBay decides it’s unfamiliar with my IP address and now wants to place an automated call to my phone to give me a secret number I have to enter on their web site. Finally get logged back in and edit the shipping information, which for some reason thinks where you last shipped from several years ago is more relevant than where you just told eBay your shipping location is. Look at the clock and it’s 10PM already, and that’s just the first item I wanted to list on line. Sigh. eBay is making just donating my extra stuff to a charity and taking the tax write-off more and more attractive. My new apartment is an a ZIP code that is very ethnically and economically diverse. There’s areas that are in a historically low-income, majority-minority neighborhood, and there’s areas (not far away) which are thoroughly bourgeois, where palatial homes enjoy sweeping lake and mountain views. It seems this diversity is allowing me to get a glimpse into how con artists prey on the disadvantaged and vulnerable. 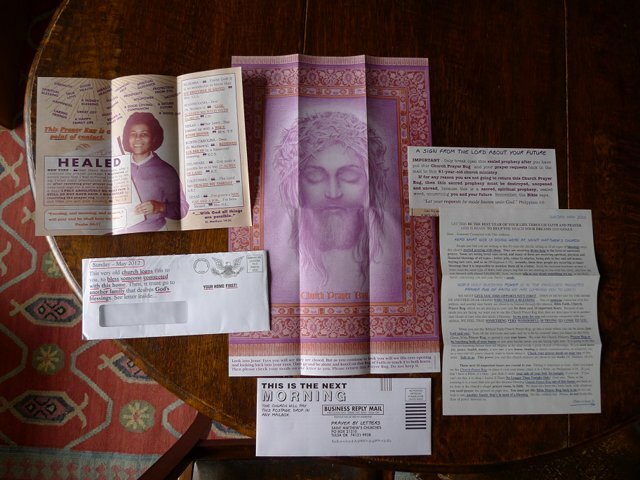 Witness the very strange junk mail I received from the so-called “St. Matthew’s Churches” of Tulsa, OK (complete with a cheesy paper “prayer rug” that I’m supposed to have a spiritual experience with because of an optical illusion about Jesus’ eyes opening), promising financial riches to all who send in their prayers. Not surprisingly, they are very well known scam outfit. This is the weekend which, if everything goes as planned, I will get all my stuff back. I’m heading down to Portland to have the movers empty out my storage unit and move its contents up here to my new apartment in Seattle. Then comes the process of winnowing things down until everything fits easily; I’m assuming there will a stack of boxes in my bedroom (and maybe random boxes in other spots, too) for at least a month or two until that process is finished. Possessions always seem to expand until there’s more of them than can fit easily in one’s home, and I’ve basically determined that a one-bedroom apartment is about as much space as it’s ethical for a single person to demand in this world of dwindling resources. I’d probably feel differently about that if I lived in a small rural town, where 1-bedroom apartments are not common, venues outside one’s home are limited, and real estate is inexpensive. But as it stands, if it’s too much stuff to fit in a 1-bedroom apartment, it’s too much stuff. All in all, it’s an attitude that’s a healthy middle ground between being the junior partner in a shared house (and having extremely limited personal space), and having a whole detached single-family house (or most of one) to oneself. What’s the iPad Good For? Having just received one as a generous and unexpected gift (witness previous entry), I’m trying to puzzle that out for myself. It’s significantly bulkier and heavier than my Slingshot Organizer or the scraps of paper I write shopping lists on, so I cannot see it replacing either. It’s also significantly heavier than my paper journal book, though it ties it in bulk. However, typing on a “keyboard” that appears on a touch screen is every bit as slow and error-prone as it always seemed to me it would be, so it’s of limited utility as a journal-entering device. A keyboard would rectify this (and they are available), but then the result would be both heavier and bulkier than what it replaces. It’s also much heavier and bulkier than my MP3 player, and it’s an awkward form factor to use as a camera. That leaves a device suited primarily to the consumption of information in digital form, be it in the form of Web pages or e-books, one which can be pressed into service for entering text if that need should arise. It is definitely less heavy and bulky than the alternative of a laptop computer. If you purchase an adapter, it also possible to download images from a digital camera into an iPad. The same advantages of less weight and bulk (compared to a laptop) apply in this case, too. So, it’s a nice gift that will at times come in handy, but I also don’t expect to be carrying it with me routinely; the things it does better than the existing alternatives tend not to be things I do all that frequently away from home. Test of creating a post from new iPad. Well, this confirms what I’ve always thought about touchscreen “keyboards”: they won’t ever put mechanical ones out of business. Very tired after a long day of moving, because even if I didn’t do most of the lifting, I did enough of it in the unpacking I did and moving the particularly fragile and valuable stuff myself. Even got the Internet connected on the same day. I’m also glad that I decided not to schedule the cleanout of the Portland storage locker for this weekend. That would have simply been too much, too fast. One last quick post before I pack up my computer. The next time I use it, I will be in my new apartment. Everything was basically waiting on finding a job, and I found one. It’s spring, the easiest time of year to find a new home. Last time I looked for an apartment in Seattle, it was the winter holiday season, the absolute worst time of year. And with that, farewell until I sign on from my new home. In principle, it’s something I like, because I have found that living by myself can be unduly lonely at times. In practice, I do not think it is for me, because a variety of factors intersect in my life, and the end result of this intersection is that there really are not many suitable shared housing opportunities out there. The first factor is that I’m nearly fifty years old, and like most people my age, I’ve managed to accumulate a set of personal possessions that reflect both my interests and my life history. It’s not an excessive set of possessions by any means (I haven’t filled up an entire house with them), but it’s more than can fit in a single bedroom. The second factor is that with one exception, shared-housing opportunities tend to involve but a single bedroom; in other words: just not enough space for me and my possessions. What I’ve done the past two years is to cram about half of my stuff into a storage locker, but I’m starting to miss having access to some of that stuff. The exception is if one is the senior partner, i.e. a homeowner looking to rent out a room. The senior partner is expected to come with a house full of things, and only offer an empty room to the junior one. The problem with being a senior partner is that I have no desire to become a homeowner: I don’t like Seattle enough to be willing to make such a commitment to staying here long-term. Seattle works well for me right now because I’ve found a job that seems to be a good match. However, if that job vanishes, and I find work in someplace more to my liking such as Bellingham, I want to have the freedom to pack up and leave town. The third factor relates to collective houses, i.e. properties owned by a collective where I would be an equal partner, not a junior or a senior one. There’s actually one which is a very good match for me here in Seattle, all things considered. But I’d still get merely a room, and the location of that property leaves much to be desired, because it’s surrounded on three sides by freeways. Not only is that an aesthetic downer, experience has taught me that excess exposure to tire dust and other traffic-related toxins makes me significantly less healthy (the dirtier the air, the more often I get colds, and the longer it takes to get rid of them). At this stage, collective living ends up being very much like living in the city of Portland: it’s something which is very appealing in the general case, and not very suitable for me once one brings the particulars of my life into it. So it’s back to living in a single-person household for me, at least for a while.